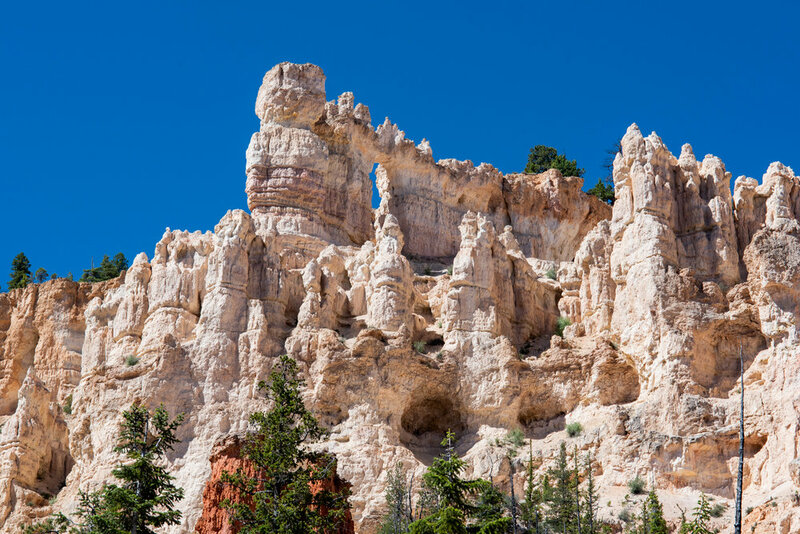 Bryce Canyon National Park has been a park that I have wanted to visit for a few year now. I somehow knew that this park was well worth a visit, and possibly deserving of more attention than it seems to get. Being fairly close to Zion, this park seems to be the smaller, less crowded option for a visit. 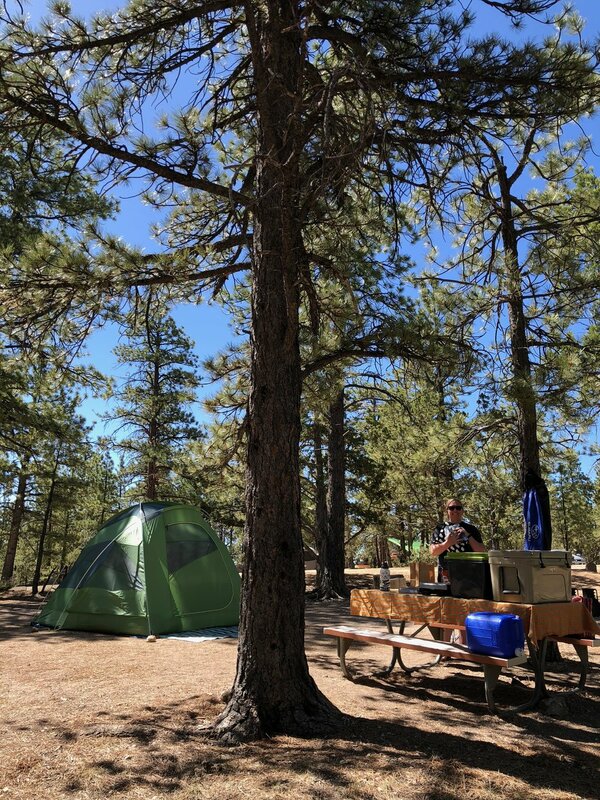 We spent a couple of days in Zion National Park, then rolled over to Bryce with a hotel reservation, but hoping to find a first come first serve campsite. As we went through the entrance, the Ranger said we should have no trouble finding a site, so we got very excited and drove straight to North Campground. The campgrounds here are divided by camper size and tent only sites, so we went right for the camp sites assigned for tents. 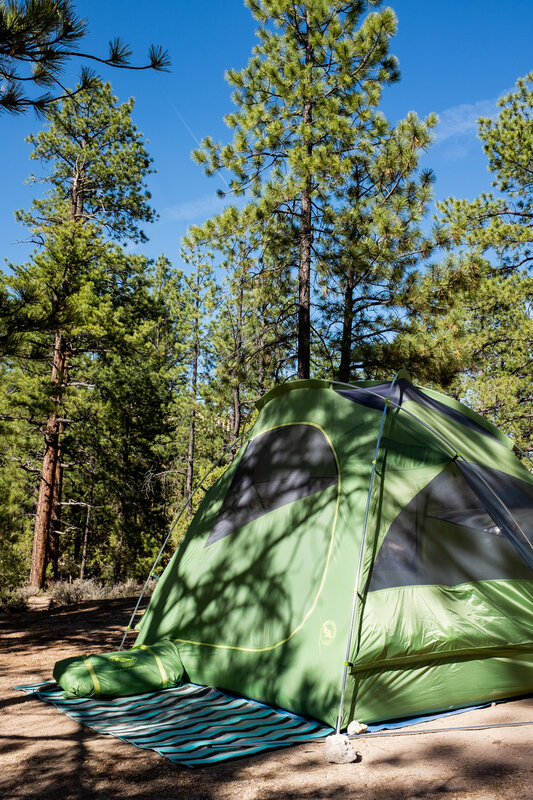 There were probably 10 sites open at around 10:00am on a Monday morning, and we spent a few minutes checking out a couple of spots, before rolling into #100 and finding our home for the next few nights. The spot ended up being a great one - right at the edge of the loop, so we only had neighbors on one side. The bathroom was a short walk away, with a dish washing station and running water to refill our water bottles and jugs. We spent our first afternoon driving the park roads and stopping at all of the scenic turnouts. 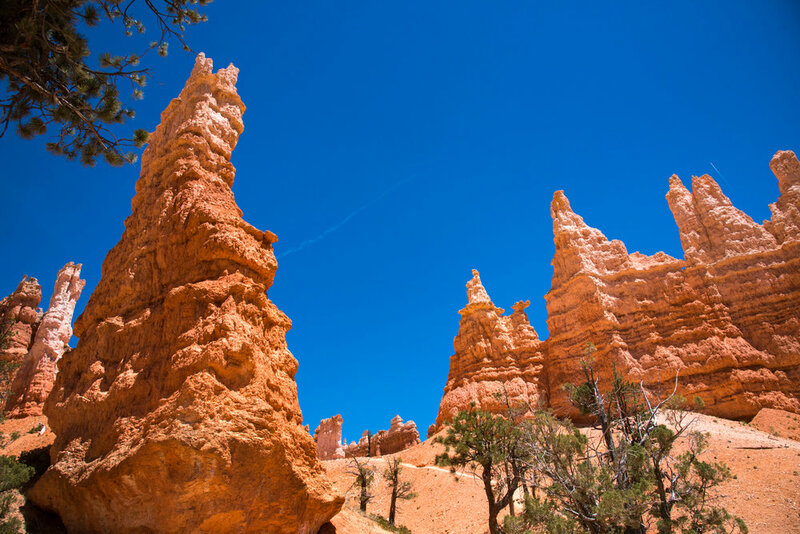 The “canyon” is huge, and full of amazing hoodoo’s and other rock formations. 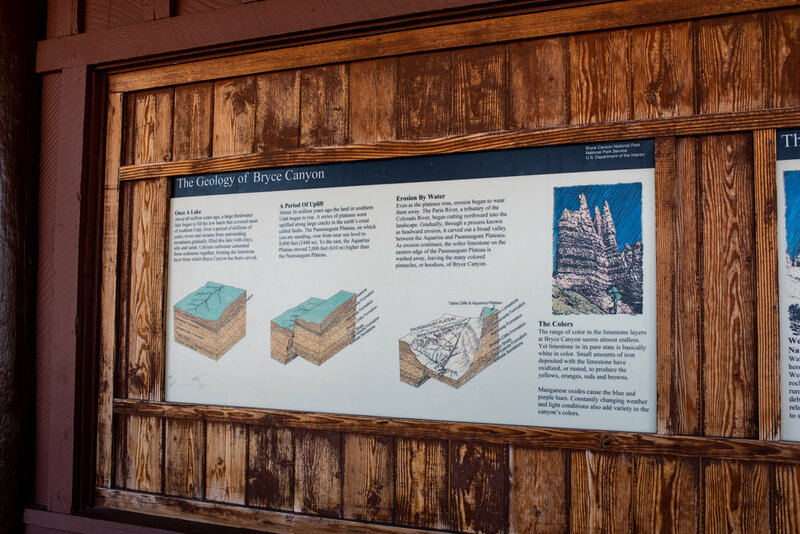 The canyon is actually an amphitheater, but we'll call it by it's proper name of Canyon. The colors are unreal and just beautiful. We enjoyed the trip all around the park road, and would recommend this drive to anyone passing through this park. 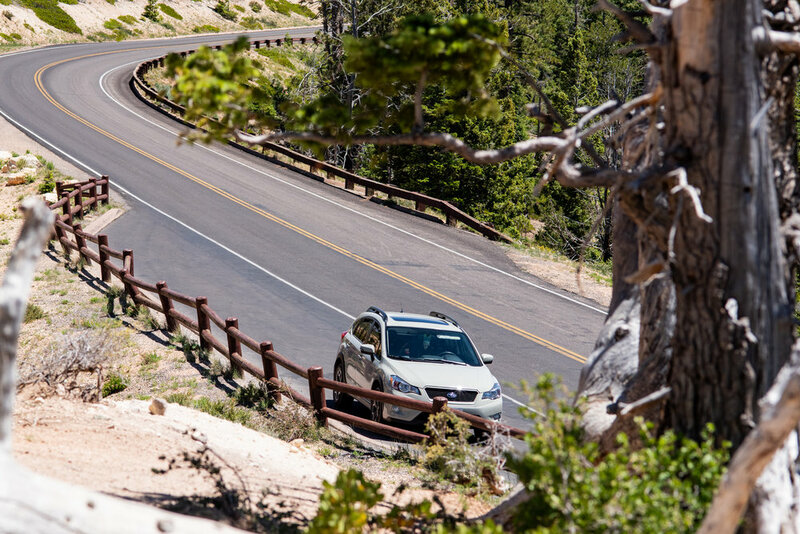 The Scenic Drive is an 18 mile road that ends at the park high point - Rainbow Point. It features several viewpoints and overlooks, including Natural Bridge and Aqua Canyon. It's an easy drive and gives a great overview of this beautiful place. We enjoyed the drive and stopped at almost every pull out, then headed back to the ranger station to get some hiking tips. 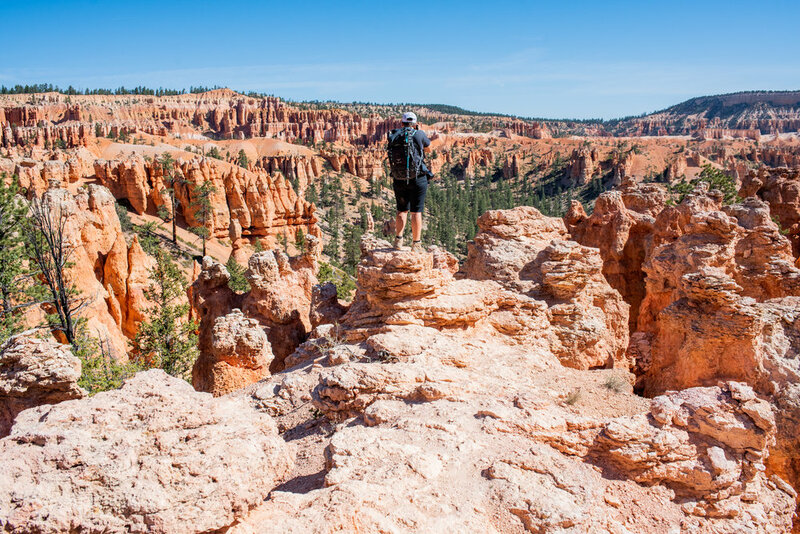 We had planned to tackle the “Figure 8” which is Navajo Loop, Peekaboo Loop, and Queens Garden Loop trails all combined into one - the ranger said this was a great hike to get a good view of what Bryce has to offer and reminded us to take along a lot of water and have fun! It was extra hot during our June visit, so water was definitely something we needed and packed a lot of, and still ran short on by the end of the hike. We got up the next morning and went straight to the trailhead. 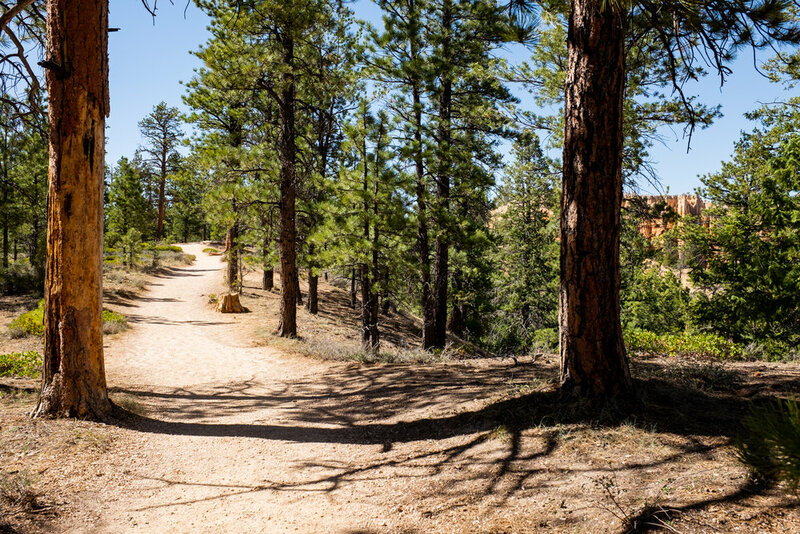 The Figure 8 is a combination of three loop trails that give you the best of everything this canyon has to offer. The trailhead for the best start (according to the Ranger) is at Sunset Point. There is lots of parking here and we had no trouble getting a spot at about 7:30am. The Navajo Loop is the starting point and it gets off to a quick start. It is an immediate trip down into the canyon. A steep trail, that quickly turns into switchbacks, on that amazing red dirt. 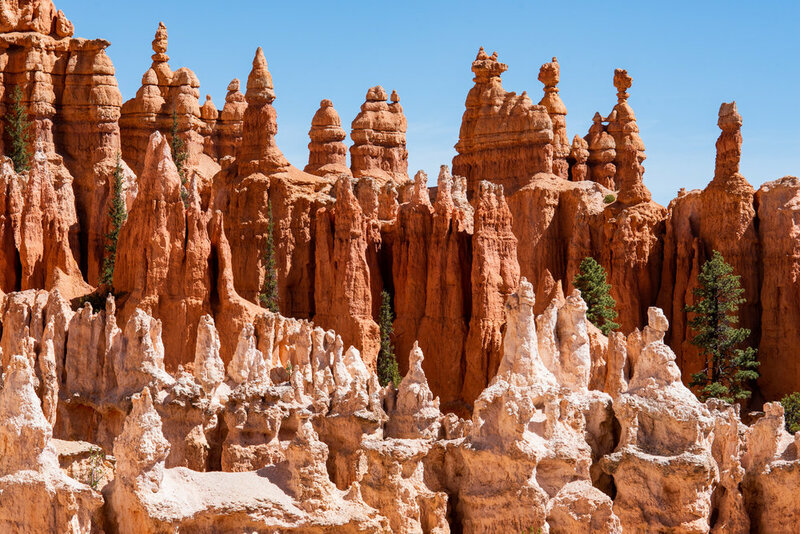 The hoodoo’s and rock formations are incredible as soon as you get started. Look for Thor's Hammer right at the start. The switchbacks are amazing to see from the top, and to turn around and see from the bottom. Pretty quickly, thanks to the steep descent, the trail lands in the tight hallway that is known as “Wall Street”. This narrow canyon is amazing, with tall walls shooting up on both sides, it seems that you are in the bottom of the canyon already! There are some very tall, old trees growing up in this area that just add to the awe-inspiring beauty of this specific spot. Past the Wall Street area, the trail enters an area with more trees and what feels like a sparse forest of trees growing out of red dirt and rocks. You are no longer looking down at the hoodoo's, but instead, standing at the base of some big red rock formations. This is the first 0.7 miles of the hike. Follow the trail until a small sign points to the Peek-A-Boo loop. A short 0.2 miles on the connector and a fork in the trail appears. We were told by the Ranger that this loop is popular for horse riders, and they recommend taking the hike clockwise. We followed the directions and headed up the left side of the trail. This loop starts to climb almost immediately, and starts giving some amazing viewpoints right away. This was our favorite part of the Figure 8... we were standing at the base of huge hoodoos, but also had sweeping views. The trail has a lot of up and down sections, with a few flat areas, and it was a hot and tiring trek, but the views made it worth it and gave plenty of opportunities to pause and look around. We started catching glimpses of the Wall of Windows, which just got better the closer we got. 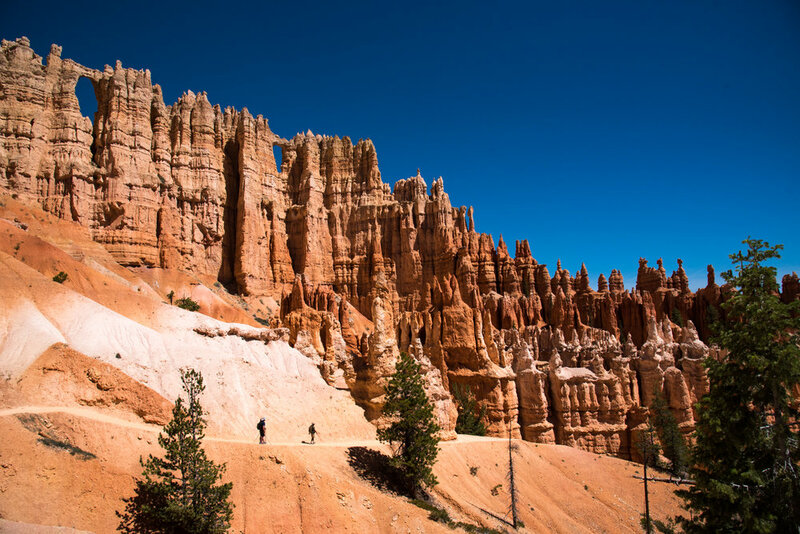 The formations along this trail are some of the best we'd ever seen. 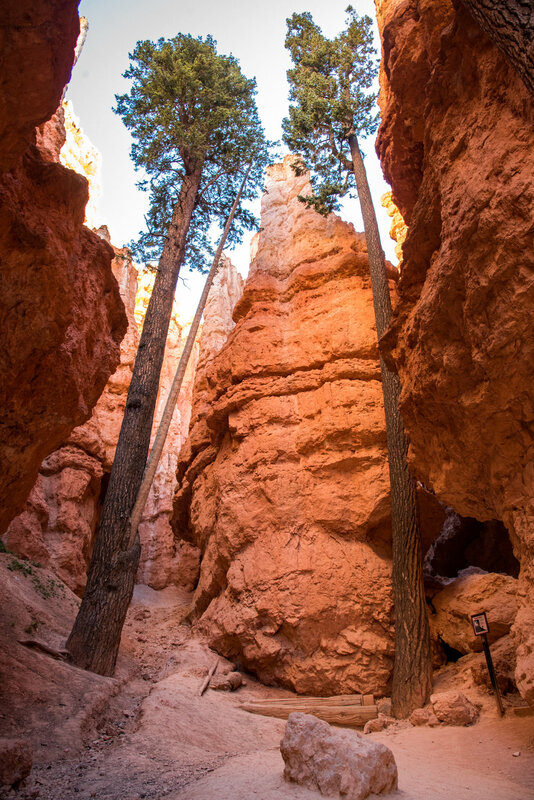 Along Peek-A-Boo, there is a junction to Bryce Point, which is a steep and hard way out of the trail. Stay on Peek-A-Boo to continue the amazing views and to continue the Figure 8. There is another small alcove along the way which leads to a small outhouse restroom. This is only open in the summer, and seems perfectly placed for a short break on this hike. Continuing on, one of the best views on the hike opens up in front of us - the Wall of Windows with the switchbacks laying below it. We would eventually hike those switchbacks, but we paused to take in the tiny humans walking along that path under some tall rocks! No lie, the switchbacks along this trail are tough and seem to go forever, despite the loop being a short 3 miles. 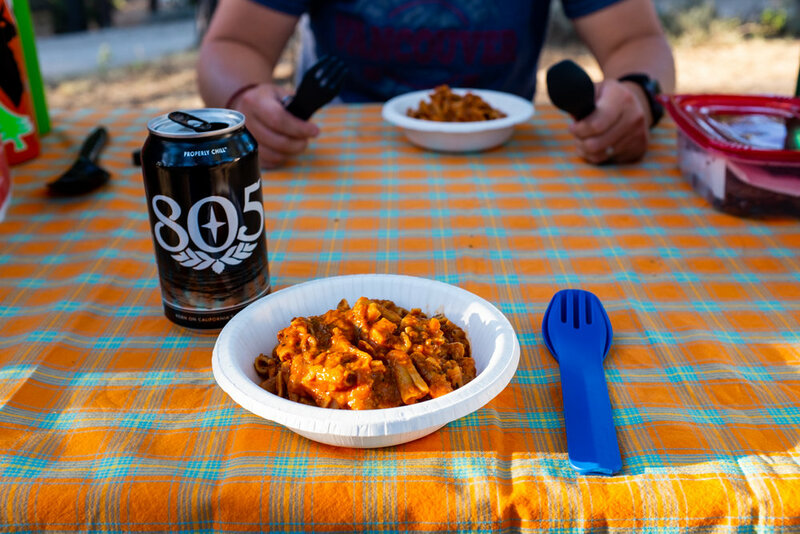 The hike is entirely worth the struggle, but on a hot day in June, definitely be sure to have more snacks and water than you think you'll need. We passed a few hikers who were struggling and gasping for air, and we were those hikers at least once. The trail continues to a tunnel that provides a small retreat and some shade, then drops you right back down into the canyon where you started this trail. The tunnels are fun for photos, but we honestly appreciated them for the shade they offered. It was a warm day when we took this hike! 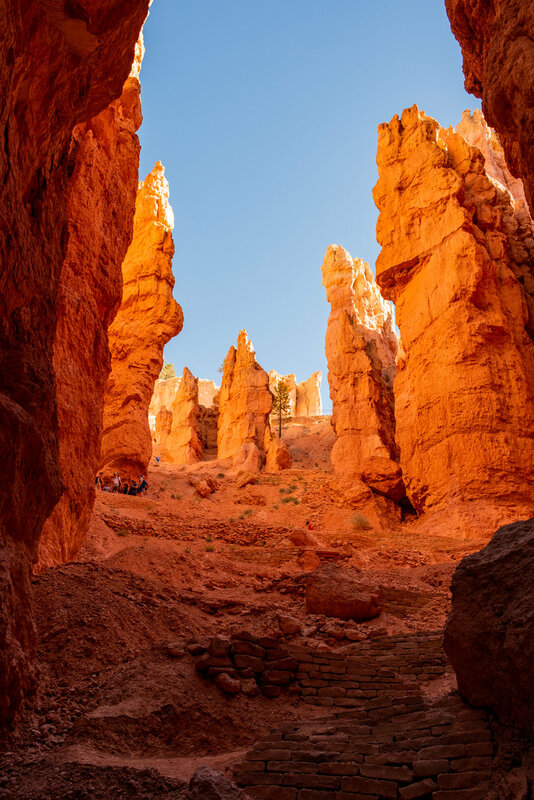 The trail will lead back to the 0.2 mile connector, and back to the Navajo Loop & Queens Garden connectors. There are a couple of benches at the junction, and some wonderful shade trees. We enjoyed resting on those benches and having lunch in the shade. A Ranger hiked by at one point and let us know we had the "best seat in the park" for lunch - we agreed. After a brief rest, we got back to the business of hiking out of this big canyon. The Queens Garden Loop is a short 0.8 miles to the "Queen" and not as full of ups and downs as Peek-A-Boo was. 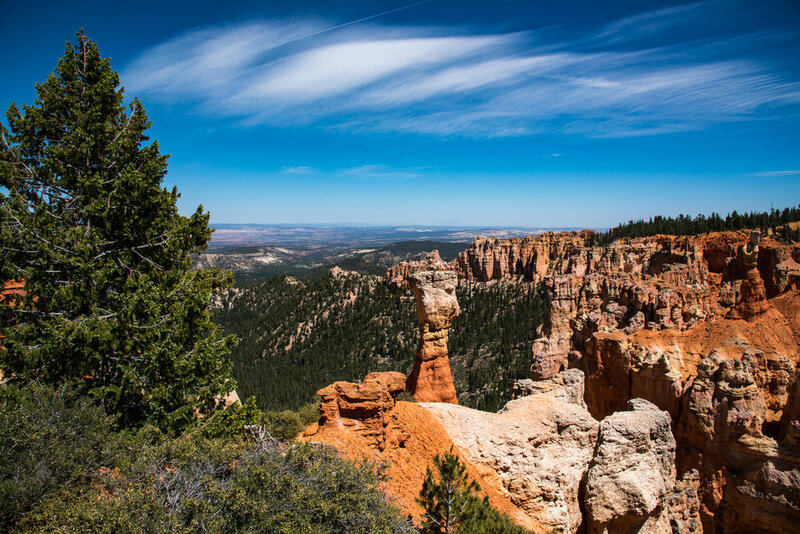 One special hoodoo sits waiting for visitors here - it resembles a queen on her throne, thus the name of the area. A spur takes you the queen and it is well signed, so you you can't miss it. She's in the center of the photo above, top row on the right! We had read that taking the Queens loop was the most gradual way to get out of the canyon, and being only 0.9 miles long, we thought it'd be somewhat easy. Maybe the heat was just getting to us, but the hike started to feel like it may never end towards the very end. The surroundings were still stunning and worth seeing, but it was hot. Along Queens Loop, we went through more tunnels and took advantage of their shade, and we enjoyed the varied landscape and long sweeping views of the area. For the last quarter of a mile or so, the switchbacks return, and are the logical way up out of the canyon... but we were exhausted when we made it to the top. At the top, the trail ends at Sunrise Point. It's a flat, 0.5 mile stroll along Rim Trail to get back to the car at Sunset Point. We had fully achieved that exhausted and rewarding feeling that comes after a long, hot hike. While we were relieved to get to the top and ready to go find some cold water and a big lunch, we were so proud of completing this trail and seeing every amazing view along the way. Along the way on this hike, we started a little game of "What's That Hoodoo"... here are a few of our favorite shaped ones - what do you see? 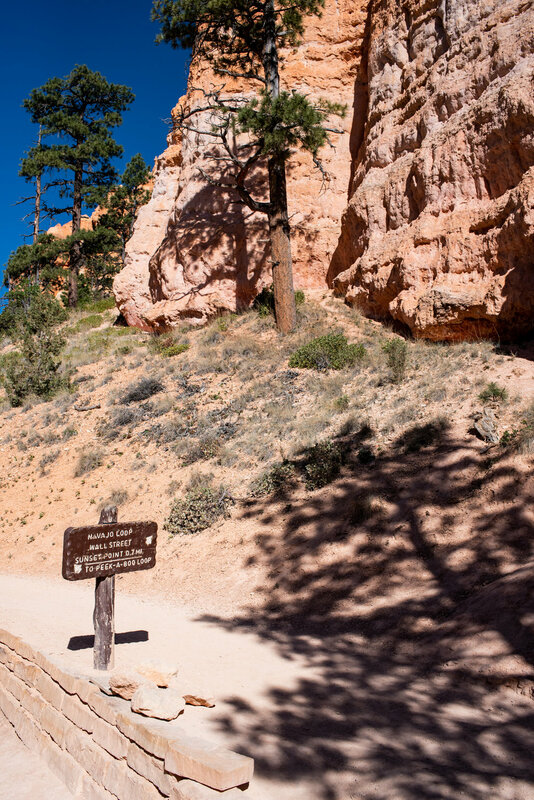 Bryce Canyon National Park describes this trail as a 6.4 mile double loop, with a 500 foot drop into the canyon, many up and down areas and switchbacks, and then climbs 320 feet out at the end. The starting point is at Sunset Point. 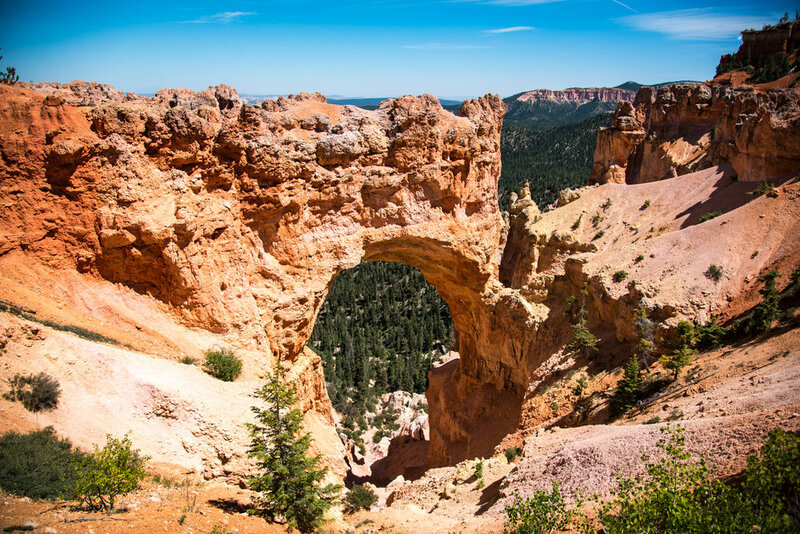 Navajo Loop (0.7 miles) to Peek-A-Boo Loop (3.0) to Queen's Garden Loop (1.7). It ends at Sunrise Point, 0.5 miles away from the starting point. 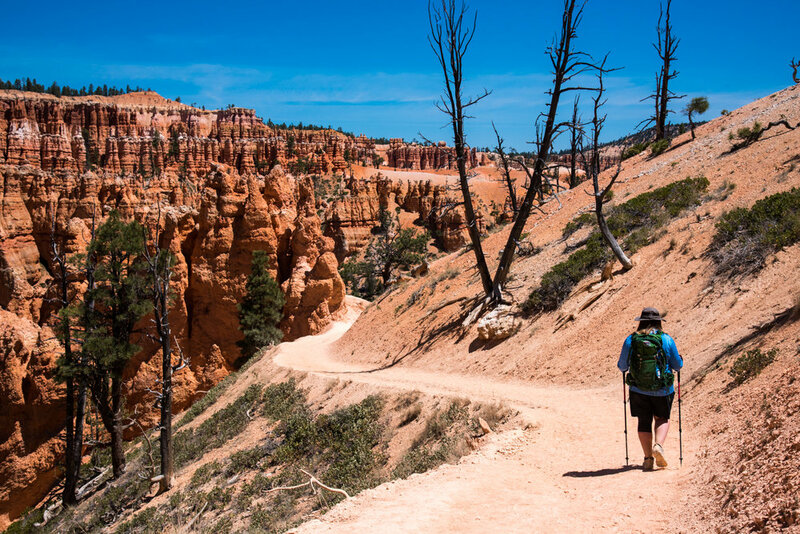 This was the only "big" hike we did in Bryce. We happened to visit over a very warm couple of days, and just didn't have the time or energy to plan any additional hikes. We had hoped to hike the Fairlyland Loop, but it will wait for our next visit. 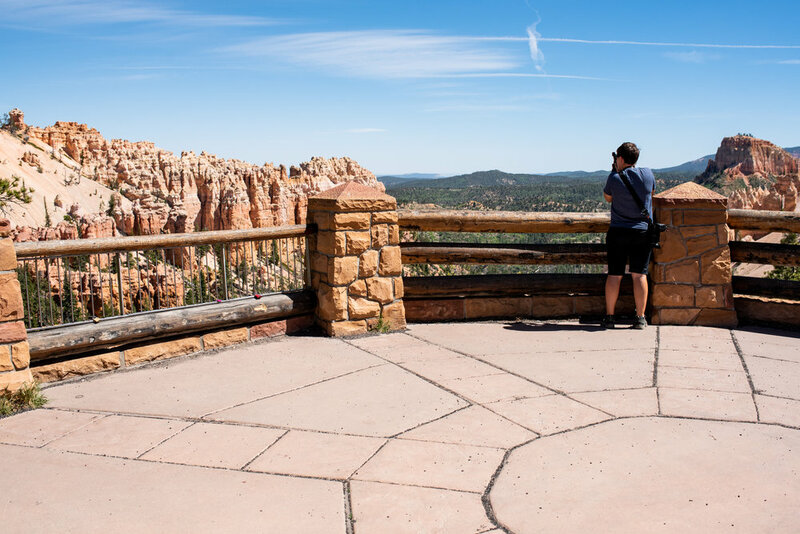 Bryce is also a fun place to play peek-a-boo! This Park stole my heart and imagination, and quickly moved into my top 5 parks. This may be my favorite of all Parks. 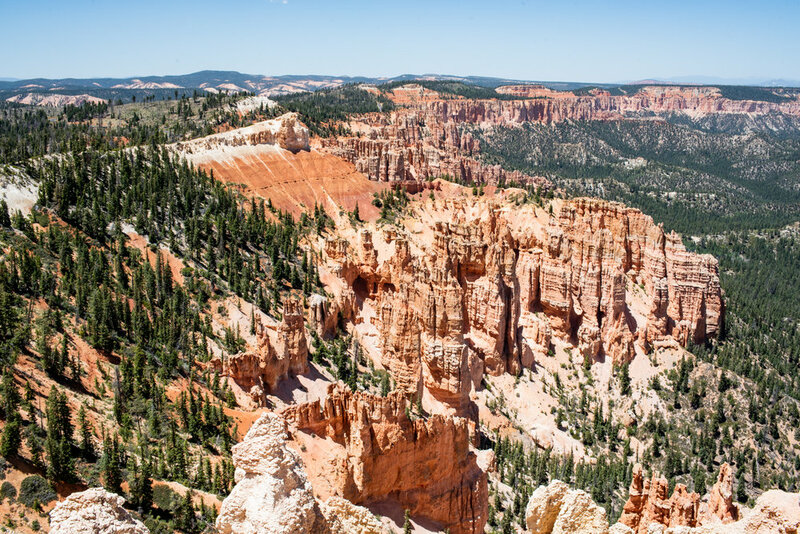 Bryce has such diverse landscapes and amazing scenery, and it isn't as crowded or hectic as other parks can be. We participated in a fun adventure that the Park has set up. They have several signs out along trails with benchmarks. You can snap a photo or take an etching of the marker. The signs instruct you to "collect" the benchmarks as you hike, and then return to a visitor center for a prize! At the end of our hike, we went straight to the visitor center, despite being sweaty and tired, and claimed our prize for "Hiking the Hoodoo's"! This was so fun, and truly felt like a huge reward for finishing the hike! We are already planning a return visit, hopefully when the park is covered in a light blanket of snow. The trails, the Rangers, the scenery - everything about this park was an excellent adventure and we just can't wait to get back! 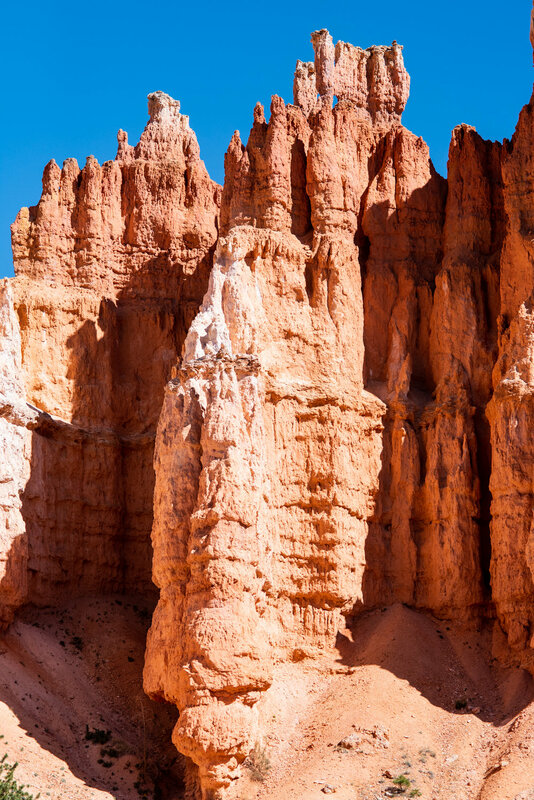 Have you visited Bryce? Share your stories with us - we'd love to hear from you!